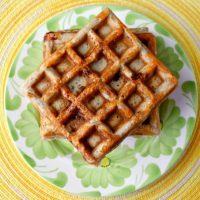 Buckwheat and Pepper Jack Waffles are nutty in flavor with a hint of spice from the Cabot pepper jack cheese. They’re perfect topped with poached eggs and hollandaise or rarebit sauce. Did y’all see all the recipes that the #BrunchWeek bloggers shared yesterday? They all looked delicious!! I hope you’re following along and make sure to enter the giveaway! There’s 6 prize packs to be given away at the end of #BrunchWeek. You could be one of the lucky winners! Last year or the year before last I can’t remember, I had this recipe on the list to make. It was a total failure. They were like hockey pucks and really not edible. Of course, they weren’t a yeasted version, which might have something to do with it. So, this year when I saw we were getting the amazing Red Star Platinum yeast, I knew I had to put these on the menu this year. That yeast, if you haven’t worked with it, is AMAZING! Truly is amazing. Making anything with that yeast is so easy. It proofs perfectly, forms the best gluten, and is truly the best yeast I’ve ever used. I don’t think I can say enough about it except I wish I could find it in my local store! Many many years ago in my life BH (before the hubs) when I had a different spouse, I bought this mix for buckwheat pancakes and waffles. I was – who am I fooling!? I will forever be looking for and trying new things. Like that red rice I learned about from this weekend’s post. I had buckwheat pancakes on a trip somewhere and thought they tasted rich, nutty, and delicious. Consequently, when I stumbled on this box of mix I knew I had to purchase it and try them. And they were rich, nutty, and delicious just like the ones I had at the restaurant. Mmmmm oh so good. Fast forward many years later and Mom gave me some buckwheat flour when she moved. Wow has it been that long? I’ve had this bag of buckwheat flour in my pantry for a couple of years in an airtight container, mind you, so it’s perfectly fine. It’s been screaming at me to make some buckwheat waffles. This year, I tried again so it would stop screaming at me!! Unlike last year, I went with a yeast batter for these waffles. Buckwheat can be a little dense if you’re not careful and I thought the airiness of adding yeast to the batter would keep them from turning into hockey pucks again. And I was right! Especially with that awesome Red Star Platinum yeast. 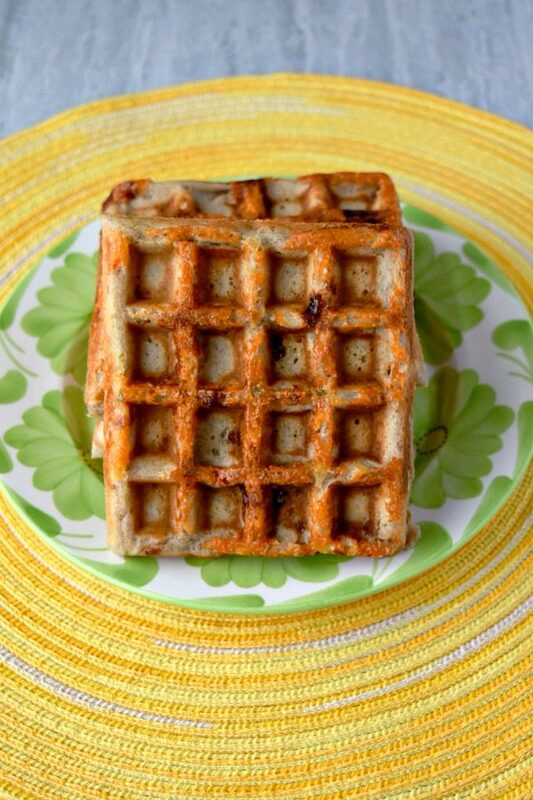 Of course, when you’re going with a savory waffle, it’s always a good idea to add some cheese. Heck. It’s always good to add some cheese no matter what you’re making!! That’s my motto anyway. Since Cabot sent us a lively assortment of their delicious cheese I knew some would be fated for these waffles. Cabot always sends the most delicious assortment of their cheese. I’ve been eating Cabot since before it was in stores here. My sister lived in Vermont and I was blessed with being able to purchase BLOCKS of it to bring home. That Vermont cheddar, if you haven’t had it, is the best flavor by far. Though that Alpine is pretty darned good, too! The hubs said to me after bringing in the Cabot cheddar package for #BrunchWeek, “This is the only package I’m excited to see this week.” No offense to the rest of the sponsors! He’s just a cheese fiend! He loved the recipe I made last year with Cabot. That Cheddar French Toast with Crab Hollandaise was pretty darned fabulous, if I may say so myself! This year we got some spicy cheese! Initially, I was going to put the habanero cheddar in these waffles, but tasted it beforehand. That’s when I decided some of the recipients of these waffles might not appreciate that. I’ll have to save that cheese for us to eat. If you like spicy, it’s the best combination of Cabot and spicy. I lowered the spice factor and added their pepper jack to these waffles. It has the perfect little spice and all that rich, Cabot flavor. It is the creamiest cheese!! And truly addicting. Don’t say I didn’t warn you! The combination of the Red Star yeast and the Cabot Pepper jack make for the most delicious, savory, buckwheat waffles I’ve ever had! Yes, even at a restaurant. They’re tender, rich, nutty, and full of Pepper jack flavor. And, as if it wasn’t enough that there’s cheese on the inside, I thought it would be a great idea to put some of the cheese on the outside, too! So, I sprinkled some Cabot pepper jack onto the waffle grid, poured the batter over it, then sprinkled a little more on top to have that crispy cheese crusted on both sides of the waffle. Yup. That’s what you’re seeing in those photographs right there; the pepper jack crust! I know. I’m brilliant, right? It was like a eureka moment right there! I loved how the cheese crust made that French toast taste scrumptious least year and thought I’d try it again this year. You be the judge. Tell me you’re not drooling! Seriously. I’m drooling and I have them for breakfast today! I can’t wait to taste that nutty buckwheat flavor and that kicked up pepper jack cheese. Top these with some poached eggs and your favorite hollandaise or béarnaise sauce. Or queso! You could totally turn these into the base for a delicious southwest breakfast topped with salsa and more delicious Cabot pepper jack! Have you tried the Cabot habanero cheese? Are you looking forward to trying the Red Star platinum yeast? Make sure to enter the giveaway to win one of those amazing prize packs! You could win some of that amazing Red Star yeast or a delicious pack of Cabot cheeses. I’ll get you a head start on the entry! Make sure you follow them on social media to get ideas on other ways to use these great products. Twitter, Facebook, G+, Pinterest, Instagram, and YouTube. 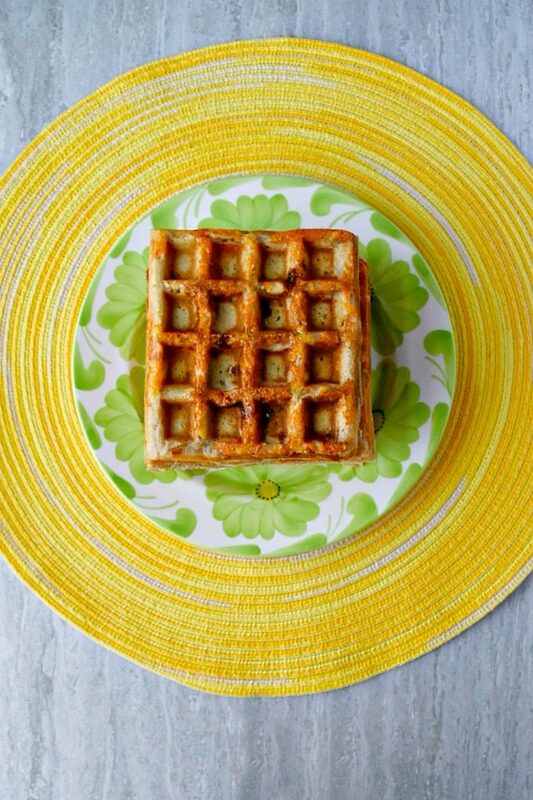 Buckwheat and Pepper Jack Waffles are have a nutty flavor with a hint of spice from the Cabot pepper jack cheese. They're perfect topped with poached eggs and hollandaise or rarebit sauce. Combine the yeast with 1 teaspoon sugar and the warm milk in a large mixing bowl. Allow to rest 5 minutes or until slightly bubble. Once the mixture is bubbly, add the next six ingredients (flour through salt). Stir in 1 cup of cheese, cover, and let rest in a warm spot for about an hour or until double in size. Preheat a waffle iron. Spray with cooking spray or brush with butter and sprinkle the bottom with a little cheese. 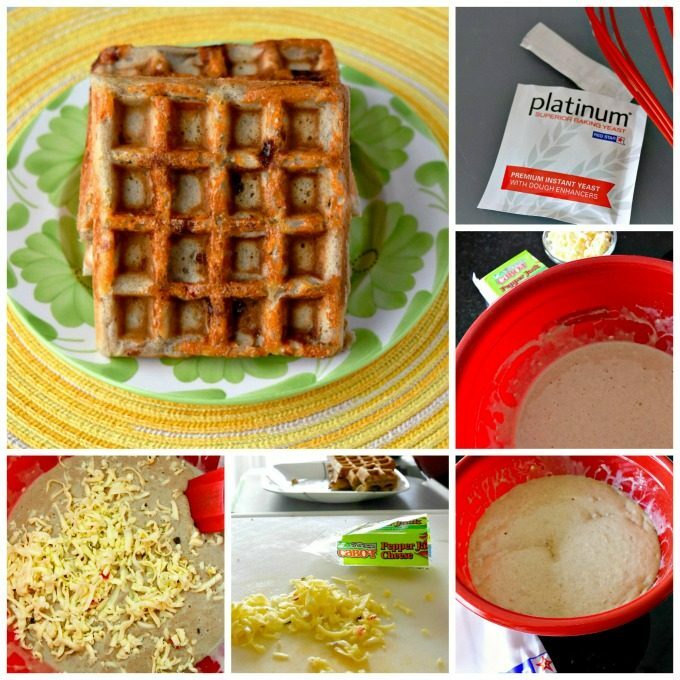 Add 1/4 to 1/3 cup of the waffle batter (according to your manufacturer’s directions). Sprinkle with more cheese and cook 3 to 4 minutes or until crispy in the outside and no longer steaming. Serve topped with poached eggs and your favorite hollandaise or rarebit sauce. 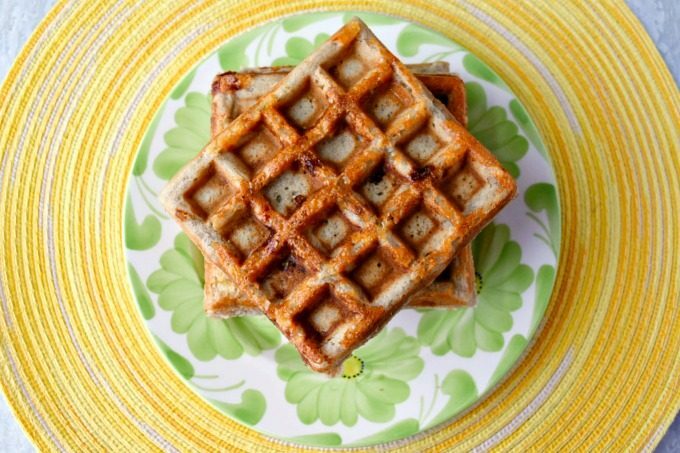 Adding pepper jack cheese to a waffle is the most genius idea, EVER! Thank you! I thought so, too. Especially Cabot pepper jack. 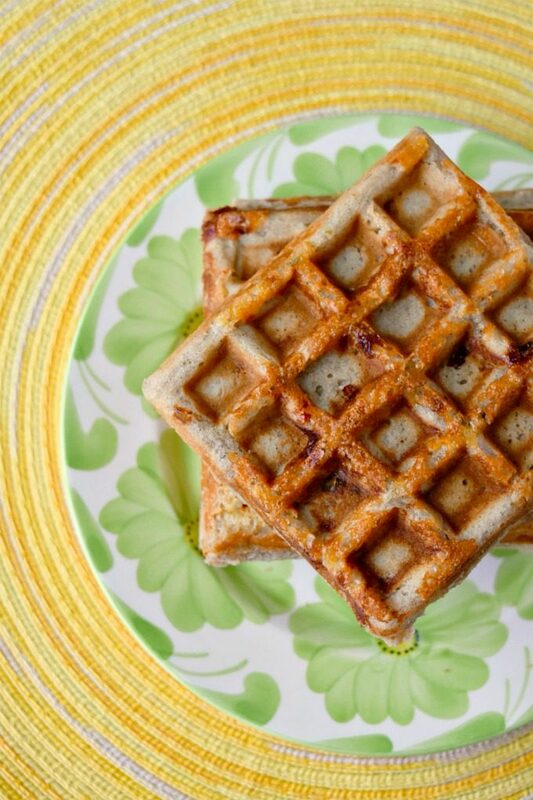 I don’t often have savory waffles but these sounds delicious! Thank you! It’s the only kind of waffles I can have with the hubs. He doesn’t do sweet waffles. I am drooling and I just happen to have some buckwheat in my cupboard too. Will definitely look for the platinum yeast as Arnokd uses Red Star in his breads, and baguettes are next on the list to make! These look yummy, I would use a mikder cheese as we are not spicey people, but we love Cabot!! I haven’t seen it here, but I keep looking for it. It’s is the best yeast I’ve cooked with.